Sometimes Divi will break and throw up errors. 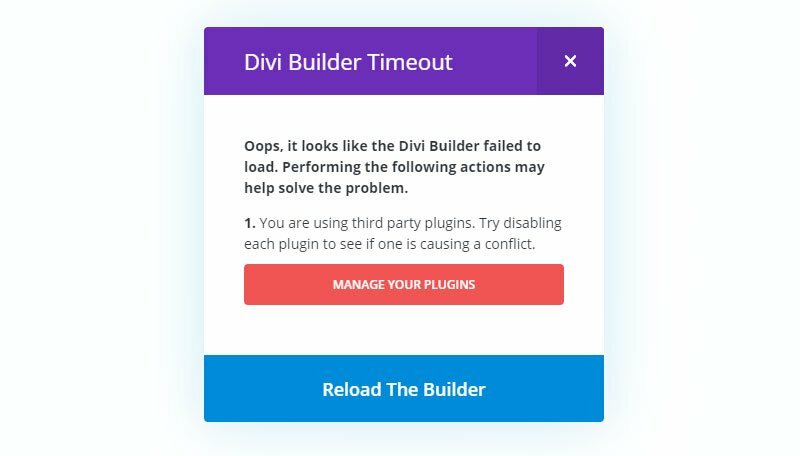 The Divi builder timeout warning might happen on your Divi site after you make theme or plugin updates or seemingly, whenever it likes. The good news is that to solve the problems, it is usually just a case of changing a few settings in your website hosting to make sure that Divi is able to get the resources it needs to run properly and without producing error warnings. If you are seeing the builder timeout warning above asking you reload the builder, then you may need to edit some of the settings associated with your hosting. You can try each of the steps below to try and fix the Divi Builder timeout (and other Divi errors) and get back to producing great Divi websites again. If you are unsure about how to make these changes you should contact your website host tech support directly. 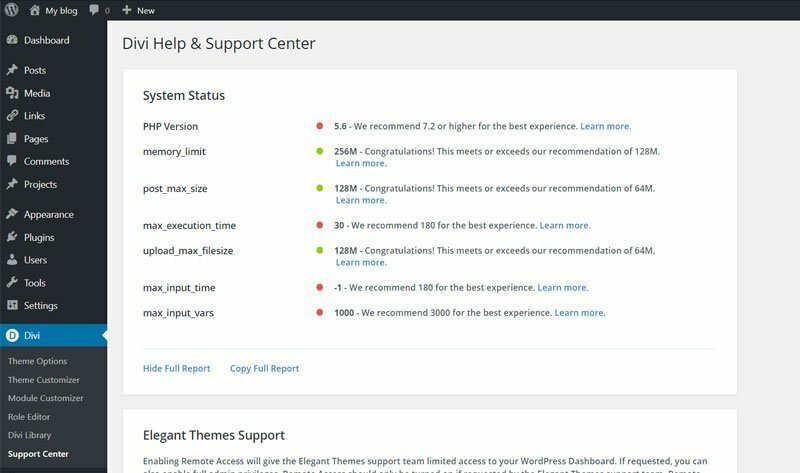 With Divi version 3.20 ( updated 03-07-2019 ) you can easily check your Support Center to see what issues there may be with your site. The System Status area will let you know if your PHP version and variables are set correctly and you can enable Safe Mode to check if your Builder Timeout issues are caused by a 3rd party plugin conflict. If your System Status area is showing that your server settings are incorrect you can follow the steps below to fix the builder timeouts you are experiencing. Elegant Themes recommend PHP version 7.2 or higher for the best Divi experience (and no builder timeout errors). You may need to change your PHP version from that set as default in your hosting plan. I am currently running PHP version 7.2.14 on Divi Theme Examples and all seems to work correctly with no builder timeout errors. 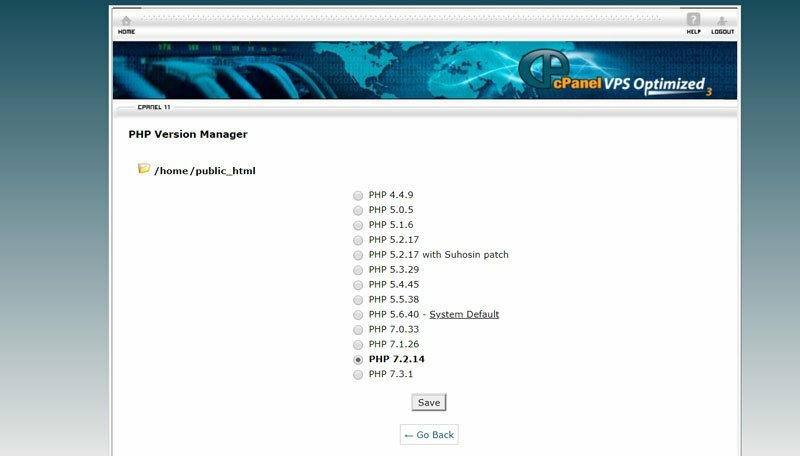 If you have access to your cPanel you will be able to edit the PHP version yourself by going to your PHP Version Manager. You may need to test different versions of 7+ as some have caused issues for me in the past. If you do not have access to cPanel, or are afraid you will break something then just contact your host and ask them to edit the PHP version for you. You can view your settings by going to the Divi Help & Support Center in your dashboard. Go to Divi > Support Center and your website settings will be shown in the System Status area, with a warning for any that are set too low. Some hosts will allow you to edit the PHP limits via your cPanel. 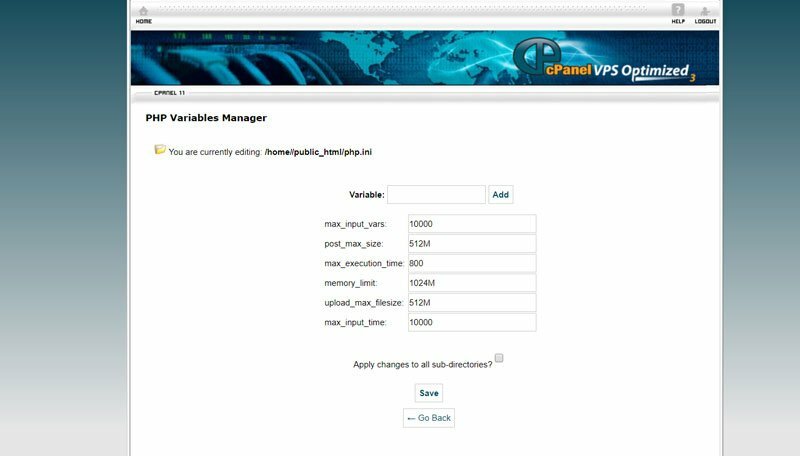 For Siteground users, we can go to cPanel and click on PHP Variables Manager, select which folders to edit and then change all associated PHP variables (as shown in the image above). If you do not have access to cPanel, PHP Variables Manager, or are afraid you will break something you should contact your host directly and ask for the PHP limits to be increased. You should ask for the following settings. Add the following code into your .htaccess file in your WordPress root directory to stop the builder hitting server limits. 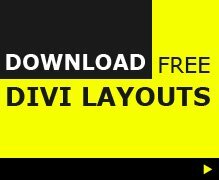 Below are a few general maintenance tasks I always check if there are any errors or bugs when I am using Divi. When Divi bugs are found with an update, Elegant Themes are usually very fast in releasing updates to fix the problems, so check you are up to date as the fix may already be available from Elegant Themes. You can view the Divi Changelog to know exactly what version of Divi is the most current. A solution that has often fixed Divi builder problems for me after an update is to make sure all caches have been cleared. Make sure you have cleared any plugin caches (WP Supercache etc), your CDN (such as activating developer mode in Cloudflare or purging cache) and then your browser cache. Sometimes I need to redo them all to get things working again. 3. Log back into the site and cross your fingers! Which Divi builder timeout fix worked for you? Let us know what worked and what didn’t. There are so many variables to consider when something goes wrong, but hopeful,ly these tips will help fix a few of your builder errors. Good luck! I’ve tried all of these options and still no luck. 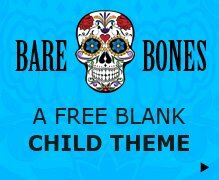 I can’t edit any of my website pages. This is my first website using Divi and I thought things were going well until this problem came along. I was going to use for this theme for another client, but I’m having second thoughts about that after seeing all the others users having this same issue with no resolution. Is this problem fixable??? Susan, here is what I do when I get this spinning issue. It is usually when I have first opened a page for editing and clicked a module to edit. What helps is I reload the page while the icon is spinning. Then, I update the page. Finally, I go into the module I want to edit. I could be wrong but this seems to have worked every time. Hope this works for you. updating to php 7.1 worked for me too. thanks for all the great tips. Upgrading to PHP 7 worked for me as well after trying all the other options. Just a thought, but this might actually be a memory issue. If the builder timeout failed due to the WP memory limit being exceeded, then PHP 7 would fix it not because Divi requires PHP 7, but because PHP 7 uses less memory than PHP 5.x. If I’m right, then an alternative fix would be increasing the WP memory limit, which could help if you aren’t able to switch to PHP 7 for any reason. Anyone found a solution? I have tried EVERYTHING and nothing works, just a white spinning wheel of divi death! Thought Divi was great until this and now completely useless to me and can’t edit my site at all! Anyone? Hello everyone, I have the same problem, I have changed from the httacces, to wp-config and I have the version 7 of php, only when I deactivate the woocommerce if it works well, but being an ecommerce I can not deactivate it, I have already installed the new version. and I still have the same problems. If you are using Cloudflare, please put your site on development mode. Then refresh the page and done! Now start working!